Boogex can load speaker cabinet impulse responses. Voxengo has got back on the freebie train for its latest plugin release, updating its Boogex guitar amp and cabinet simulator to version 2.0. This brings its interface into line with other Voxengo releases: it now features such things as undo/redo history and a preset manager. Perhaps more importantly, the amplification algorithm has been improved. 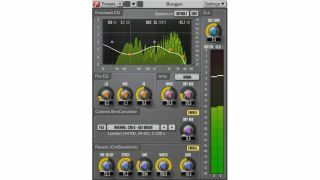 Boogex is said to offer low enough latency to be used as a realtime processor, and you can apply any cabinet impulse response you like (a selection comes included). You can download Boogex for free from the Voxengo website. It's available in 32/64-bit VST/AU formats for PC and Mac.